Goa and Kerala had the highest scores in 2016, both over 60, whereas Assam and Uttar Pradesh had the lowest, both below 40. While India has seen improvements since 1990, its HAQ score was lower than 50 for 23 of the 32 causes of death. 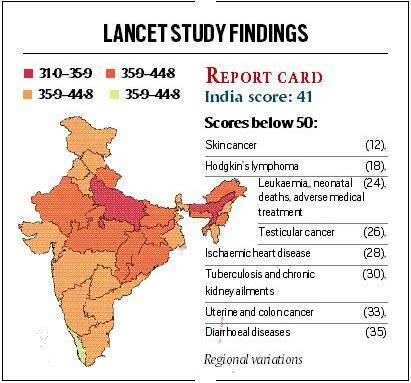 India ranks a lowly 145th among 195 countries in terms of healthcare access and quality in 2016, as assessed in a Global Burden of Disease study published in The Lancet. The study used an index based on 32 causes of death that should be preventable with effective medical care. Each country was given a healthcare access and quality (HAQ) score between 0-100. India’s HAQ score is 41.2, up from 24.7 in 1990. For the first time, the study also analysed healthcare access and quality between regions of seven countries including India. China and India had the widest disparities of 43.5 and 30.8 points, respectively, while Japan had the narrowest of 4.8 points. In India, the 30.8-point difference marks an increase in disparity from 23.4 points in 1990. Goa and Kerala had the highest scores in 2016, both over 60, whereas Assam and Uttar Pradesh had the lowest, both below 40. While India has seen improvements since 1990, its HAQ score was lower than 50 for 23 of the 32 causes of death. Particularly low were scores like 12 for skin cancer, 24 for neonatal deaths and adverse medical treatment, and 30 for tuberculosis and chronic kidney ailments. “This is really disappointing – well behind BRICS countries,” Dr Madhukar Pai, Canada Research Chair in Epidemiology and Global Health told The Indian Express. Dr K Srinath Reddy, president of Public Health Foundation of India, felt that the reason for India’s poor show is the low density of health workers in the poorly performing states. “For instance the Janani Suraksha Yojana has registered a rise in the number of institutional deliveries. However there is no demonstrable correlation with lowering of maternal mortality in certain states,” Dr Reddy said. This scorecard shows that the health system is weak and while centrally funded schemes have provided health access in some areas, quality has not improved in certain states, he added. The global average HAQ score was 54.4. Iceland and Norway top the list with a HAQ score of 97 each.